Now there really isn’t much more that you could put in that first line to hook me…”Alys,” Hi my name is AlysSA. “Staked out to be sacrificed to the local dragon,” I WANT A LOCAL DRAGON. “REVENGE,” HAVE YOU MET ME?! PERFECT ALLY IS SAID DRAGON?! SIGN ME UP RIGHT NOW. I snatched the book up quickly with an indifferent “Thanks..” despite laughing maniacally on the inside. “I’m fond of revenge,” the dragon answered. 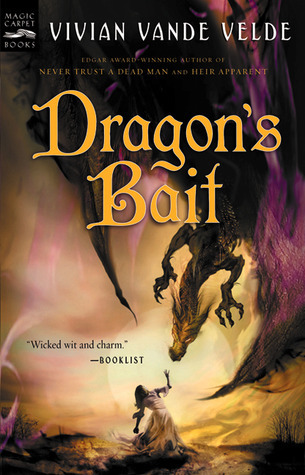 I am a little torn in a way because on the whole, I really enjoyed Dragon’s Bait. It was a story about a strong heroine, and a DRAGON, how could I not love it? However I didn’t entirely love the ending and the way that Alys did a bit of a character change in the way that she gave up her vengeful thoughts and decided to take the blame for basically ALL OF THE THINGS. Sigh. I suppose I can understand how she has MORALS and realizes that revenge is not nice, but to give up completely just seems a bit weak. C’mon Alys, pull yourself together! Then there is the romance…I was totally on board for that. I mean, he’s a dragon, who is also a man. A dragon-man, if you will. How can you resist, amiright? Alys does a pretty good job, though. I mean, Selendrile isn’t really the NICEST guy (I obvs love him) and he broods a lot (*fans self*) but he is also kind of demeaning, and I don’t really have time for that sort of thing. So when things get all sorted out in the village, Alys decides to follow him into the sunset, and for once in my life, I didn’t approve. I am not saying that she shouldn’t have stayed with him, because…see above: dragon-man, but it seemed as if she was doing so just because she didn’t really have much else going for her. So as you can see, I am conflicted. What’s a fellow uppity woman to do? Personally, I decided to take this book and not look too deeply into the parts that made my feminist and English major bits all eye twitchy. If you can take a minute and think, “I would really love to read a quick novel about a strong gal, a handsome man who is also a ruthless dragon, and their escapades,” then pick up this novel immediately. I can’t completely agree with the woman at The Book Barn, my love for Patricia C. Wrede’s Enchanted Forest Chronicles far surpasses my enjoyment of Dragon’s Bait, but it is a good pick for any lover of dragon tales. 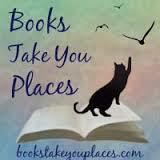 This entry was posted in Reviews and tagged dragons, fantasy, magic, romance, young adult. Bookmark the permalink. It’s been a looooong time since I picked this book up from the library. I don’t think I’d yet matured enough, back then, to fully appreciate the inherent delight of a dragon-man, though it’s a plot feature I’ve never wholly forgotten.